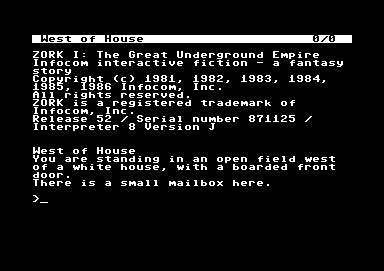 Scott Eric Kaufman at acephalous has perfected the game of Zork as an expression of the travails of life on the net. The best of his scripts IEHO is DISBELIEF. Zork is absolutely the perfect game to describe the adventures of the last few days which Eli has attempted below with many borrowings from Scott. Oh yes, beware the grue. In the spirit of such games, readers are invited to submit continuations of the story to bring it up to date. Copyright (c) 1980, 1982, 1983, 2006 Rabett, Inc. CLIMATE ZORK! is a registered trademark of Rabett, Inc.
You are standing in an open field west of a white office building, with a boarded front door. There is a small mailbox here. It is such a beautiful day out. Why not explore awhile? Sorry privacy rules forbid revealing that information. > What will my readers think? > Think of the disappointment? The net will go wild with speculation. You will own the news cycle. The door is locked. There is evidently no key. You are behind a white office building. In one corner of the building there is a window which is slightly ajar. You are in the break room of the white office building. A table seems to have been used recently for the preparation of food. A passage leads to the west, and a dark staircase can be seen leading upward. To the east is a small window which is open. On the table is an elongated brown sack, smelling of hot peppers. A clear glass bottle is here. The glass bottle contains: A quantity of water. Taken. Thank you very much. It really hits the spot. > Something’s happened. From now until Sunday July 29th, around Noon PST, WUWT will be suspending publishing. At that time, there will be a major announcement that I’m sure will attract a broad global interest due to its controversial and unprecedented nature. If you wish to be automatically notified of the updates, click on the “Follow Blog via Email” button about midway down the right sidebar. Comments are closed, and I will not be responding to emails until Sunday. TO BE CONTINUED. We all know what happened next, but Eli welcomes your contributions to Climate Zork. "A nasty-looking troll, brandishing a bloody axe, blocks all passages out of the room." In committee, John Christy refers to mindblowing bombshelling 'paper' from Watts about some esoteric thermometers in the wild nether regions of somewhere vague. Is appropriately ignored from left, right and centre. You are sitting behind a computer. You need to come up with a solid reason for not releasing code and data. Not even a little bit of data, like station identifiers or class. It is not fair. You feel hemmed in. Even your allies have turned against you. You want to get on with your next job of sending frivolous FOI requests to real scientists, but people keep interrupting, sending you emails asking for your data. The irony of the situation is lost on you. You feel so tired and overwhelmed. You notice paper on table. >Promote paper with over-reaching conclusions. are you talking of Tony? Please respect people working hard every day with computers. "Some of you who have corresponded with me lately may have noticed that I have been brief with my responses. You may also have noticed a number of spelling and grammatical errors in recent WUWT blog postings. This is due to the fact that after over five years of blog posting, I have succumbed to a problem that plagues many people who use the computer too often -carpal tunnel syndrome." "A nasty-looking BUNNY, brandishing a bloody axe, blocks all passages out of the room." Eats axes. Burp! That was tasty. Damn it! Too quick for me! Winds up hovering from the deckhead (sorry ceiling for the non nautical) because unable to reach head. Better Google quick for a way out. Darn it. That clever Google means I only see my own biases and cannot find a way out. Sticks head back in sand. Pulls head out of sand. Says to self "Keep calm. I'm sure that with a bit of application one weekend's solid cramming can be made to look like $88K's worth of work. Joe B need never know, and wouldn't know the difference anyway. Must get Stevie in for some stats chops - he'll back me up. who here believes that fax machines still have use? who here believes that fax machines are an antiquated, inefficient system and should not be used anymore. Speaking of stupid studies, lets not forget that a fellow alarmist group recently released a joke of a press release about 2012 being the worse drought of the 21st century. The bad bites both ways gentlemen. and o ho ho ho ho by the way! Look what the good doctor found! I demand an explanation from the big carrot himself as to why the bolded sentence in the zero order draft was removed from the first order draft? Your side is actively supressing historical data, so explain to all us stupid skeptics why 900-1300 doesn't matter. The facts are precisely like John Christy said "it is scientifically more accurate to say that this is what Mother Nature looks like, since events even worse than these have happened in the past before greenhouse gases were increasing like they are today." If we were to compare recent weather events to the historical record, we can find a worse event in almost every single example. Spookytooth needs to scroll down the comments. As we've seen over the past few days, McI is not infallible. -Brutus killed Julius Caesar. Therefore Lee Harvey Oswald couldn't have killed Kennedy. Are Spookytooth and McI and Pielke Jr arguing that nothing should be done to reduce carbon pollution until the USA has been drought-stricken for 100 years? No. Oh wait, a sliver of light is showing through. Ah - There is "Stellar Christy". There is no greenhouse effect in the USA! Christ(y) said as much, therefore it must be true. Further, we'd be grossly irresponsible and selfish not to burn more fossil fuel. We must pollute the world for the sake of the starving masses in Africa or wherever they live. Like, we really care, man! "We must pollute the world for the sake of the starving masses in Africa or wherever they live. Like, we really care, man!" In Christy's defense, he started out as a pastor in the southern baptist church and got his doctorate and started studying climate later, because of a deep-seated interest in meteorology. And he's done missionary work in Africa. So I think that he really *does* care, and does believe that growth through the use of fossil fuels is necessary for Africa's economic betterment. Ms Rabett is very wise and completely correct. But the carrot was hard to resist when handed on such an enticing plate. >When in Washington DC, do not drive your car. Instead take the subway, it's more environmentally responsible. The bunnies at Rabett Run issue an earnest plea to the public to learn the reason behind the devastating drought in the US. >Global warming is real, and humanity is causing it. Really? Well, the drought is pretty scarey. I wrote: You want to get on with your next job of sending frivolous FOI requests to real scientists, but people keep interrupting, sending you emails asking for your data. Eli calls for a vote, do the bunnies want to keep this spam or terminate with extreme predjudice? Keep it. Tony Watts et al. would find the services of MERUJA OWO to be of great comfort.